The Gers is the ideal place for a slow, relaxing type of holiday. The 'South West' with its sunshine, blue sky, colourfull fields of sunflowers and green hills. The Gascony region is rural, unspoiled France at its best, with green foothills that announce the start of the Pyrenees. Explore the Gers on foot, by horse, by bike or canoe. Every season you can discover nature and culture. Make your planning today! 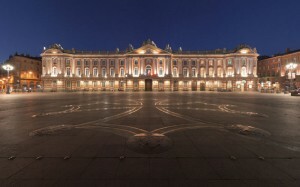 AUCH | city, culture, art, festivals The heart of the Great South West, between Toulouse and the Pyrenees. 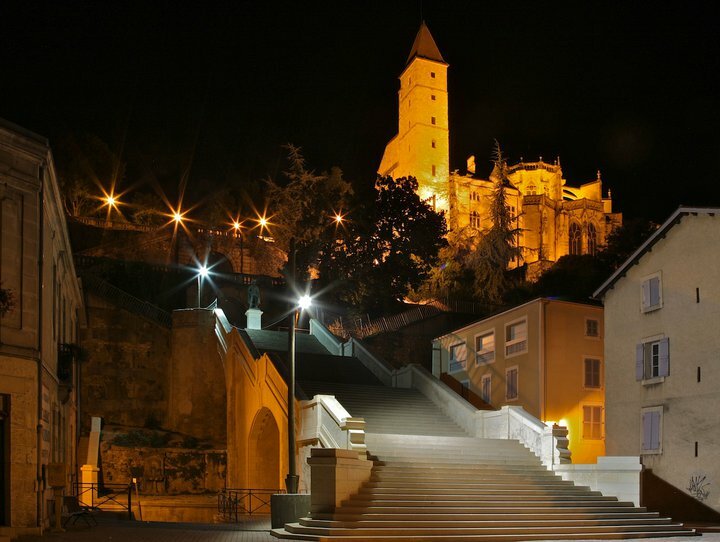 Discovering the Gers starts with the prefecture : Auch. This town of 22.800 inhabitants, shows you the gascon ‘joie de vivre’. is a major site on the route to Santiago de Compostela designated on the UNESCO World Heritage list. It’s an absolute must for a visit. The monumental staircase comprises 370 steps in total -In the middle stands the statue of the most famous Gascon: D’Artagnan, Captain of the King’s Musketeers. Nearby are the steep medieval back streets. Only the old ‘Pousterle’ does not have any steps. They enabled the inhabitants to fetch water from the river. The Gers is well known for its festivals. The most prominent example is probably the annual international jazz festival in Marciac. But many music fans also visit the country music festival in Mirande, the Bandas in Condom and the Tempo Latino dance festival in Vic-Fezensac. The newly built Cirque Theatre in Auch holds many events. Steeped in history, yet hip and lively, the enchanting Toulouse is one of France’s most beautiful cities.Toulouse is France’s fourth-largest city. Airbus, a leading aircraft manufacturer. Once in a month you can watch the Airbus transport in Vic-Fezensac. The Capitole, without a doubt, is the city’s main attraction. The impressive architecture is marked by its pink facade and numerous elegant columns. La Cathédrale Saint-Etienne is a unique display, with a mix of styles spanning five centuries. Wilson place : a trendy place. PIC-DU-MIDI | nature, walking, science, view point, Lourdes, city visite. The Starship. the complete panorama of the Pyrenees. 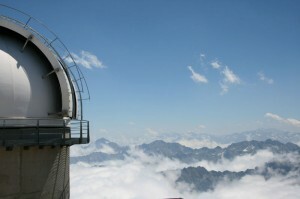 The Pic-du-midi observatory has been here since 1880 offering the most marvellous opportunities to astronomers, stargazers, and scientists alike. 110 km south of Toulouse, built on a former Roman settlement, Saint-Bertrand-de-Comminges sits majestically at the foot of the Pyrenees Mountains. Founded in the 1st century BC, it is now an important centre for art, enriched by 2,000 years of history. This is a masterpiece of Haute-Garonne heritage, absolutely not to be missed. To discover: the Massabielle grotto,the crypt buried at the bottom of the grotto (the original sanctuary), the upper basilica (1866), the Rosary basilica with its 15 chapels adorned with superb Venetian mosaics (1883-1889), the amazing Saint-Pie-X (1958) underground basilica and finally the Sainte Bernadette church (1988) and the Notre Dame reception area inaugurated in 1997. Located in the unspoilt environment of the Midi-Pyrenees, close to the mountains and nature, these spaces are devoted exclusively to relaxation and wellbeing in thermal water. The peoples of cultures long ago also recognized the great healing properties of water. Chateau de Lavardens is perched high up overlooking a valley and some of the most picturesque countryside of the Gers.<It’s an impressive castle from the 12th century. It features beautiful mosaic floors, a ‘whisper’ room. Every year, events are held at Chateau de Lavardens including music concerts and art exhibitions so its well worth the detour. The present Chateau Monluc, in the centre of Gascony, is built on a site that has been continuously inhabited since the latter part of the Stone Age. The chateau is now the headquarters of a big wine estate which produces the well known POUSSE-RAPIERE cocktail. The name Pousse Rapière is derived from the rapiere, the long light sword brought back to France from the wars in Italy by the returning Monluc and his Gascon Captains. In the same village you find Terre Blanche. With its copper-coloured stone and lush green setting, the abbey, was a perfect example of the rural charm that is Gascony’s secret. The Abbey was reconstructed and extended several times until it was bought by the Departement du Gers in 1972. After a meticulous and extended renovation, the Abbey now stands in its original historic glory and is now often used for cultural activities and events. MANSENCOME | castle, hiking, wine-tastingThe great Gers institutions – Armagnac. The ancient castle Chateau Busca-Maniban is situated in Mansencome. Stroll through the beautifully decorated rooms to end the tour in the ancient kitchen with a small taste of Armagnac. Nearby you find the historic Château de Cassaigne built in 1247 is open to the public. Join a guided tour and taste the castle’s own wine and armagnac. Take the time to explore Condom, whose heritage reflects the power of the former bishops and the wealth created by the Armagnac trade. The historical centre, which is overlooked by an imposing Gothic cathedral, is made up of private town houses built in the 18th century, of large Armagnac mansions, and of wineries and cellars, without forgetting the Armagnac Museum, of course! It is a beautiful town centred around the Cathedral of St-Pierre and although its name is often a source of amusement to English speakers it is believed to be derived from two Latin words “condato” and “Magnus”, meaning the market for the surrounding area. Larressingle, a little fortified jewel. One of the most beautiful villages in France, Larressingle nestles in the heart of the Armagnac vineyard, in the Gers. 45 Km northwest of Auch, this lovely little fortified town (the smallest in France) takes us right back to the Middle Ages. It is nicknamed ‘the miniature Carcassonne of the Gers’. With its beautiful fortified, surrounding wall, its moats and its drawbridge, Larressingle does indeed evoke the image of a medieval fortified village. At the entrance to the village, the park, (entry-fee payable) displays a reconstruction of medieval siege-engines and (other) ingenious machinery of the period. A landmark on the route of St.-Jacques de Compostela, the abbey with a church, two towers and a court were constructed in gothic style in 1318. One of the towers is an octagonal completely closed structure. The other tower is a much more square-shaped open structure carrying the church bells. In the church, which is beautifully restored, there are unique frescos with esoteric motives and black angels, on display to the public. The tiled floor is still in its original state. In the village you will find many sculptures of cats in honour of Angeline and the Legend of the Cats. Nearby you will find LES JARDINS DE COURSIANA,a unique place of exceptional quality in the Gers. Great diversity of trees, shrubs and very different flowers, both familiar and unfamiliar. The fortified village of Fourcès owes its originality to its circular shape. Its history and heritage make it one of the jewels of the land of Armagnac. Fourcès is usually classified as a bastide but it is really a castelnau, a form of habitat preceding the bastides. The village is immediately attractive for its beauty and peace. Entwined by the green line of the Auzoue, a pretty river full of fish, Fourcès opens like a living history book.